River Hill Pottery in the Eclipse Mill in North Adams. 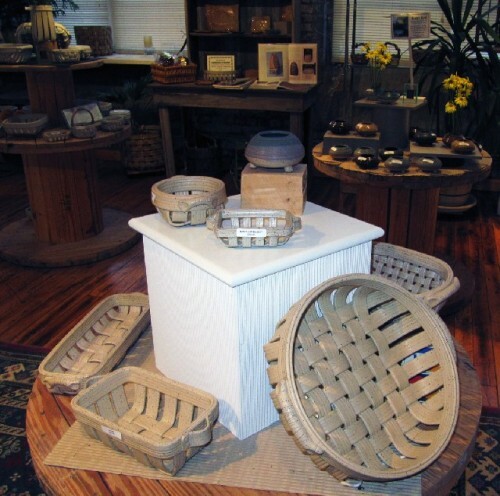 River Hill is known for ceramic baskets. 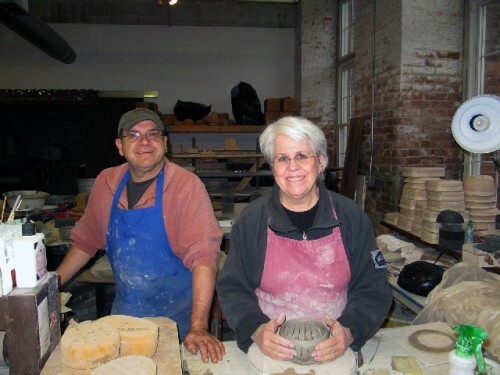 Phil and Gail Sellers are busy in the studio keeping up with holiday demand. 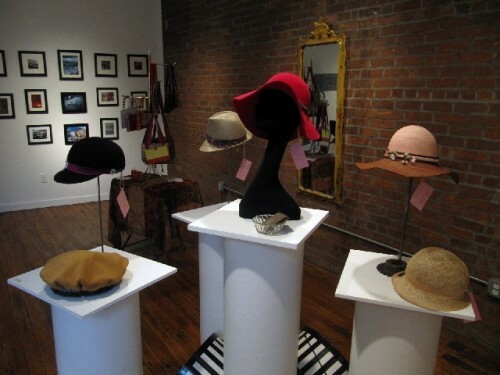 The Eclipse Mill Gallery has been set up as a holiday store. 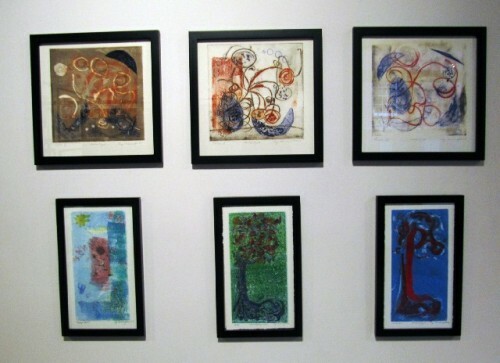 Gallery logo above works by Debi Pendel. 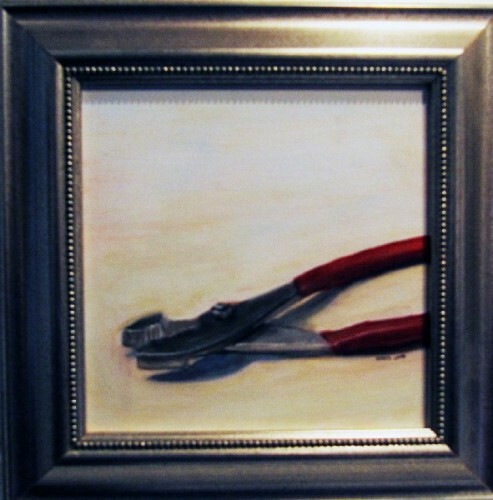 Dawn and Bill Guild collaborated to create a series of small works. 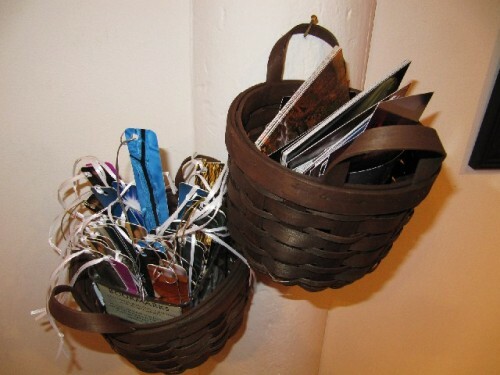 Baskets of book marks by Dan Morgan. Works on paper by Liz Cunningham. 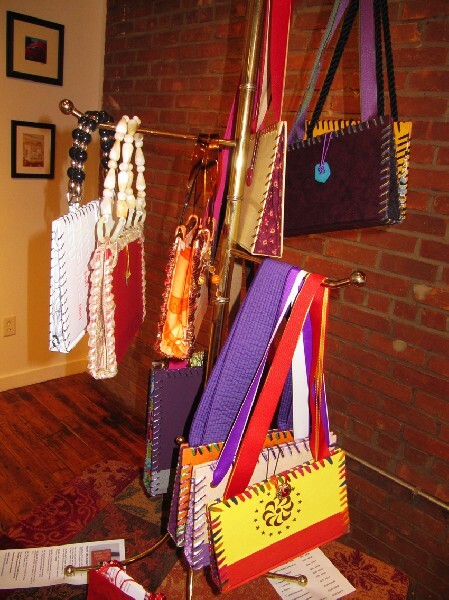 Handbags by Lynette Cornwell are fabricated from books. A small painting by David Lane. For a more personal and artful gift avoid the frenzy of the mall and instead check out the Eclipse Mill. Every day during the Holiday Season Gail and Phil Sellers, of River Hill Pottery, put out their sign to lure travelers along busy Route Two in North Adams. 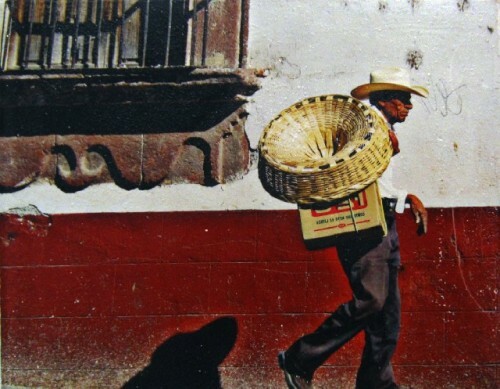 That translates into a steady stream of sales of their hand crafted, unique, woven baskets, mugs and platters. 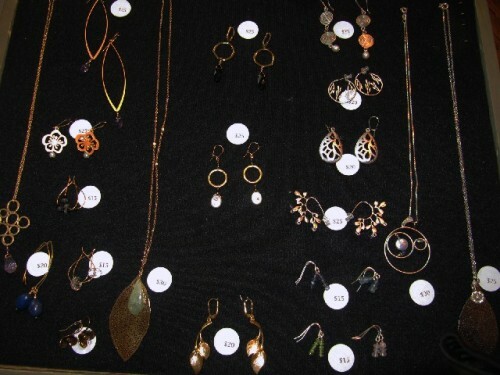 The store is in the front of the street level loft from which the studio is easily viewable. They like to interact with visitors making suggestions of other points of interest. On weekends, from now through December 23, there is another sign out on the highway. It directs traffic to the Eclipse Mill Gallery. It has become a tradition that the gallery season ends with an exhibition of affordable art and crafts suitable for gift giving. There are other options as well. The Brill Gallery represents high end, fine arts targeted to serious collectors. Also on the first floor is the bookstore of G. J. Askins. There is a large selection of affordable, used, fine arts books and rare volumes. 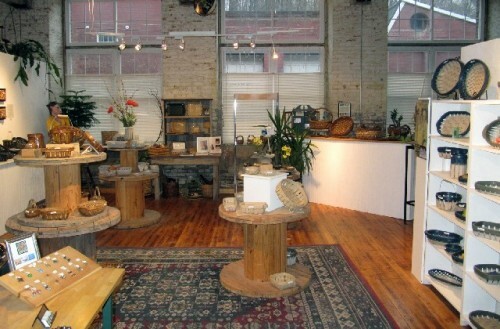 Visitors to the Mill often drop in and browse. The annual holiday show “reFINEments” in the Eclipse Gallery reflects the mandate for community outreach and accessibility. The Popup Store, so to speak, includes Eclipse resident artists as well as invited participants from the vibrant surrounding community. The Eclipse Mill is a studio/ residence building that includes 40 units. Many of the artists are activists involved in advancing the creative economy of North Adams. None more so than the Sellers. For the past two years, Phil has chaired the annual Open Studios. This summer he is working with Mass MoCA to bring an ambitious Sidewalk Sam project to the community. Gail is currently the chair of the Eclipse Mill Gallery Committee. They would love to talk with you about their projects. 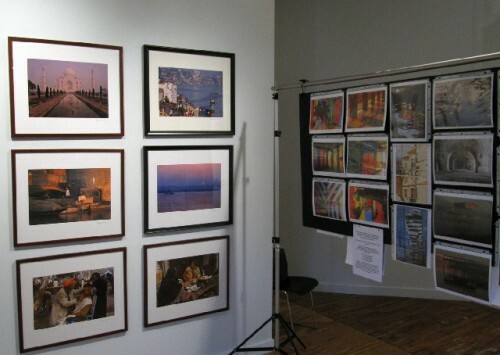 During the holiday sale the Eclipse Gallery takes a small commission to sustain its ambitious programming. 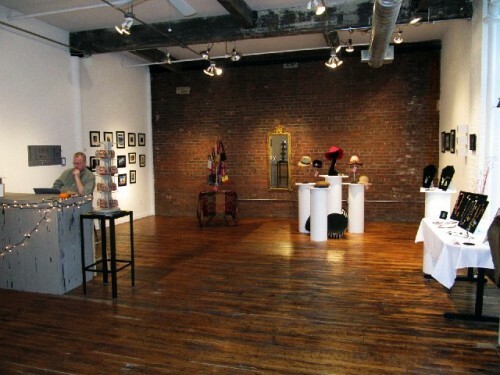 The space is considered to be one of the best, non museum, no profit spaces in the Berkshires. Each season the gallery is noted for its program of superb and influential exhibitions. It is one of the most important venues for the serious artists of the region. The gallery press release follows. 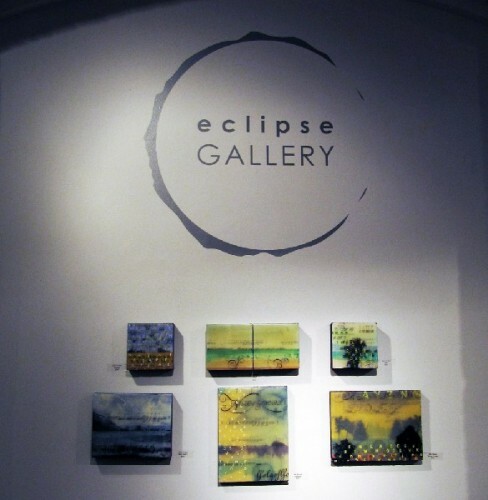 The Eclipse Mill Gallery at 243 Union Street in North Adams, Mass. has extended its hours for the holiday season. 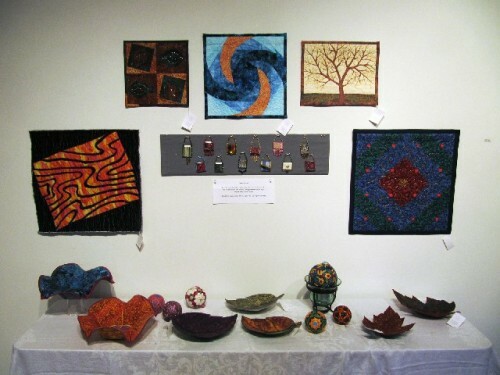 The current exhibit, “reFINEments,” features the smaller works of sixteen local artisans in a variety of two- and three-dimensional media, including photography, jewelry, millinery, fabric ornaments, bowls and other fiber arts, paintings, drawings, book purses and ceramic ornaments. All works are for sale by the artists and artisans, who include Dale Levitz, Dan Morgan, Thomas Mikelson, Dawn and Bill Guild, David Lane, Debi Pendell, Lane Koster, Rodney Wilkinson, Beth and Katie Davis, Rena Gray, Michelle Jensen, Denise Tilley, Gail Sellers, and Lynette Cornwell. The gallery will be open to the public regularly from 5 to 9 pm on Fridays and 12 to 5 pm on Saturdays and Sundays until December 23, with additional pre-holiday hours Monday through Thursday of Christmas Week (December 20-23) 12-8 pm. 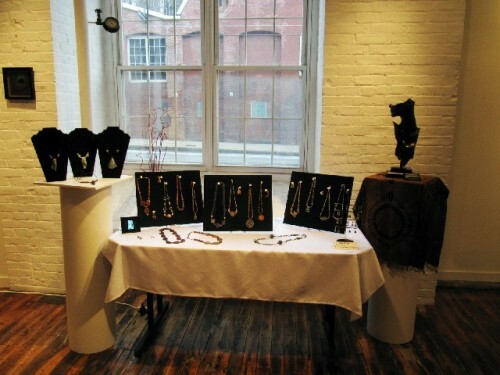 The Eclipse Mill Gallery is at 243 Union Street in North Adams, just a half mile east of Mass Moca on Route 2.